All throughout my travels in Africa my sole means of transportation has been public transit (local and long distance buses). This has been difficult to say the least, but I’ve made the most of it. Of course now most of my good travel tales are transit related! Upon my return to Johannesburg, South Africa I stayed with a friend in the affluent suburbs that circle this violent city. I felt much safer in the ‘burbs until my friend mentioned to me in the car, on the way to her place, that she was once “highjacked” at the very intersection we were waiting for the red light to turn green. I gasped and looked into the bushes for any type of movement. It was the longest minute of my life. To switch things up a bit, I took the Gautrain (regional train linking Joburg to Pretoria and Tambo airport) from her place to Pretoria and spent my last day waiting for the bus to Maputo, Mozambique. My method is to always look for an overnight bus to cover long distances, because nothing is more frustrating than sitting on a bus, awake, for 8-plus hours. I was told the bus to Maputo would take 10 hours, including the border crossing in the morning. A few hours after boarding the bus I fell asleep with my iPod on, bumping some Bunny Wailer in my ears to kill the noise coming from other passengers. Once the Wailer’s music cut out, 28 tracks later, I heard a commotion coming from the back of the bus. Mind you, I was sitting in the very front seat. I open my eyes and see two men standing next to the bus driver demanding he pull over to rest. I guess he was falling asleep at the wheel and started swerving uncontrollably. I thank those courageous passengers. Not much I would have done even if I was awake. I reached Maputo the next morning, as I was told, and spent my time sitting in cafés, sipping strong espresso and eating Portugese pastries (pastel de nata). I also checked out a great local art museum, which looked more like someone’s flat, called Nucleo de arte. 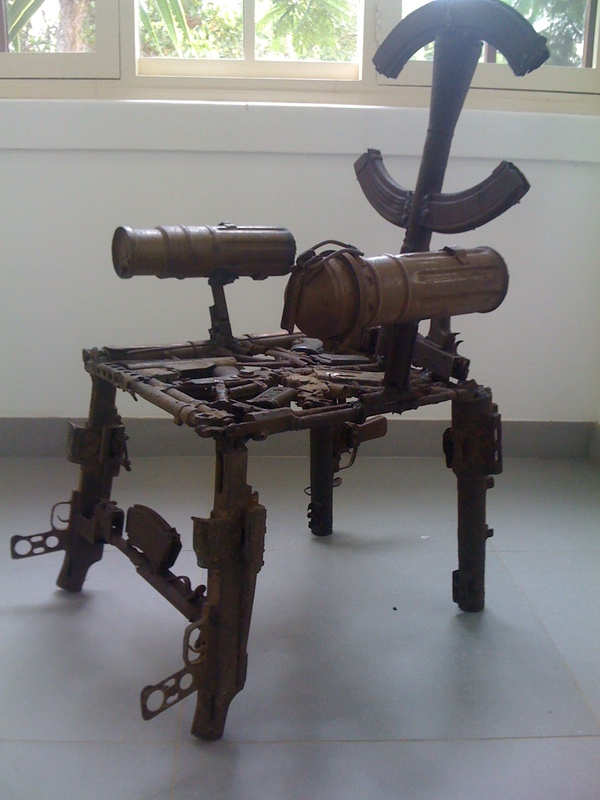 It contained a haunting sculpture, a chair made of discarded M-16’s and AK-47’s from the brutally long civil war that gripped Mozambique from 1977-1992 (democratic elections held in ’94). Up next on the impromptu itinerary was Tofo beach. This was a sleepy beach town (off-season) that is known for its seafood and snorkeling. I neither ate seafood, nor snorkeled, so Tofo’s activities were definitely wasted on this road-weary traveler. I just needed some “R&R” (Rest and Relaxation). Sunshine and beach time. Mozambique’s coastline is an untouched, meaning undeveloped, natural beauty. At least until all the proposed South African hotel chains move in and change it completely. From Tofo came Vilankulos, Chimoyo and Tete (latter two in-land, not along the coast). I mentioned earlier how I’ve been using solely bus transportation in Africa, well there’s also been a ferry ride or two (first was from Spain to Morocco when I reached African soil last November). The ferry I caught from Inhambane to the mainland, to catch a bus to Vilankulos, seemed like it was straight out of a Somali pirate training video. Let’s just say it was a bit frightening. I made my way to Malawi and crossed over and reached Blantyre from Tete, Mozambique in one horribly-long day of bus hopping. The buses in Mozambique are basically small, local transit buses, which would normally seat 11-12 (including the driver) but they’re able to squeeze in 30 (no joke). Basically, it’s just people sitting on top of each other. Not too comfortable, if you can imagine. Malawi is ex-pat central and the hostels in Blantyre and Lilongwe overflow with ex-pats (Americans, Canadians and Europeans mainly) and “over-landers.” These are travelers crossing Africa in big trucks, spotting wildlife, and staying together for many months on end. Let’s just say when both ex-pats and over-landers meet, it’s party time. I had fun drinking and going out with them, because this will end up being my life for the next 6-months (more information on this to come later). 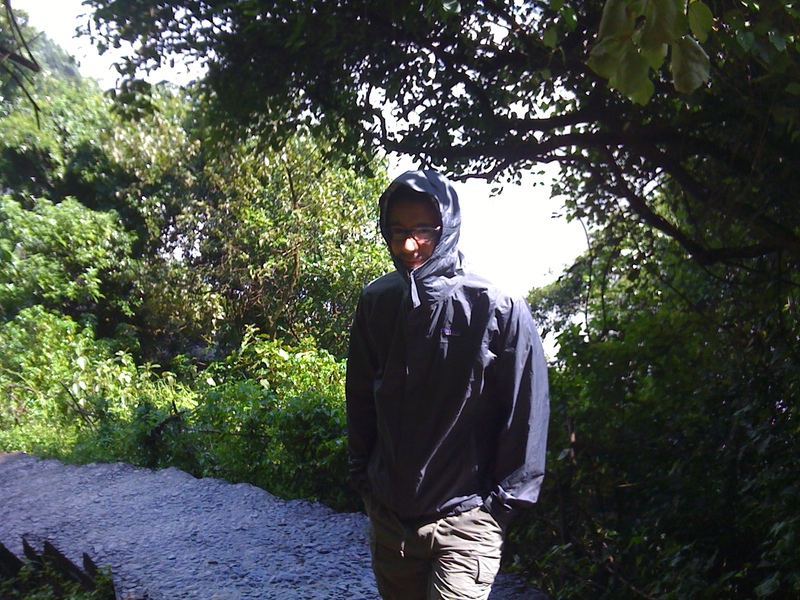 Okay, I know what you’re thinking: “You went to Malawi and didn’t visit the lake?” I will. In due time. I need to return to Malawi when I’m not strapped for time. And my reason is I’d like to visit Lake Malawi with someone, instead of visiting such a magnificent site alone. That wouldn’t make sense now would it? It would be nice to have someone to share it with. Confessions of a lonesome traveler. In Zambia this wasn’t the case at all. I have a friend in Lusaka who was expecting me, so I didn’t have to spend another week solo. I crossed the border into Zambia and spent the first night in Chipata, because I missed the connecting bus into Lusaka and didn’t really want to spend another seven hours on a bus. You get tired of buses after being on them for long periods of time. Plus, there are many more buses to come on the long road ahead to Nairobi, Kenya (my destination for this round- round 2 of Africa). Not much to do in Chipata other than go out for drinks with a few French guys staying in town. One runs a backpacker hostel in Diani beach, Kenya. I’ve heard this is a world class beach I must visit, so why not stop by and stay at his hostel when I head to Mombasa. He told me business has slowed down considerably since Kenya’s elections on Mar. 4. I can only imagine. Luckily, there wasn’t a repeat of the 2007 election when political bloodshed cost over 1,000 innocent Kenyan lives. Ironically enough, one of the men wanted by the International Criminal Court for causing the ethnic clashes and resulting deaths was elected president! Lusaka, Zambia was a great surprise. I enjoyed my time there and spending it with a friend. The both of us went to Livingstone for the weekend and I was happy to have someone to share Victoria Falls with. Actually, I just enjoy having someone’s company so I can make ridiculous comments and jokes. Not too much fun when I think of something funny to say and have nobody to say it to. 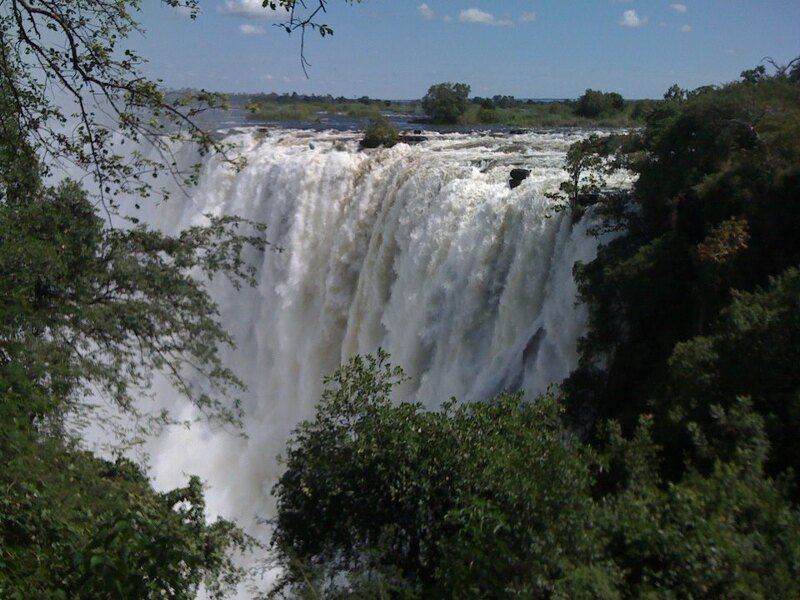 Victoria Falls will always stand out as a highlight of this African adventure. Plus, “the smoke that thunders,” as the falls are referred to, got me so wet that I would even consider renaming it “the mist that rains.” I was told the water levels are very high this time of year, so it was difficult to see them from up close due to all the mist that rained down on me. Back in Lusaka, I caught another bus, this time to Nakonde (Zambian border town) and crossed into Tanzania….And the adventure continues…. dude, how did the rest of it go? ?